OMG!!! 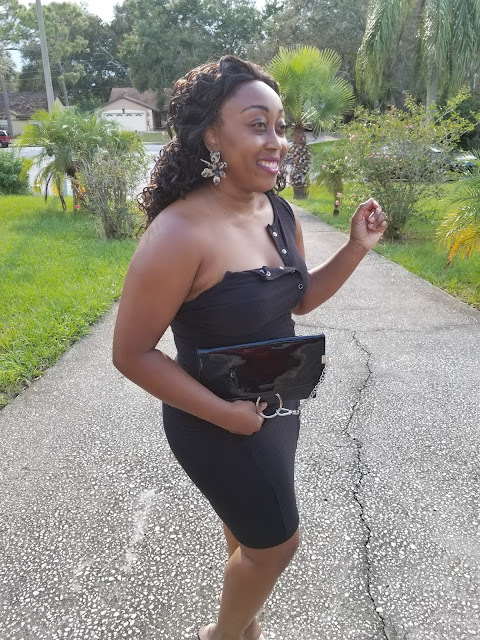 I've reached 200 followers and I'm soooo honored that you all thought it not robbery to peruse my little slice of heaven ;-) Can you believe that for 3 YEARS I lived in my own little blogger's world just seemingly posting fashion stuff for myself. Although I enjoy doing this regardless if anyone pays attention or not.....I was just so naive about the stylish femme fatales in the blogosphere. 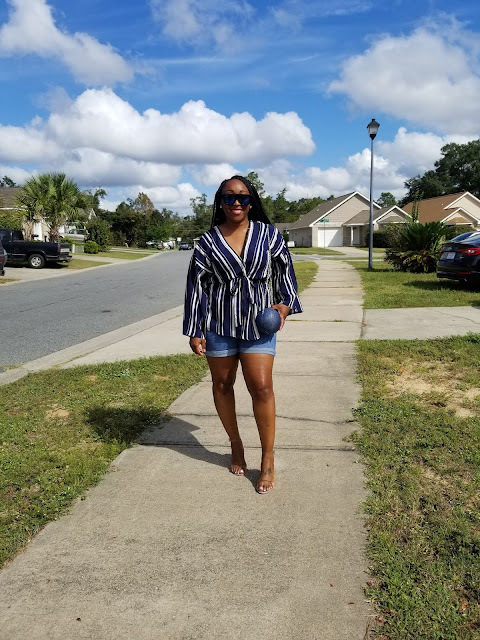 Then, I met Mimi of Lipgloss and Binky and she set me on the track to truly exposing my love of fashion to other bloggers, fashion sites, fashion lovers, etc. Thanks Mimi! But you know what this exploration did to me???? It literally turned me into a fashion blog stalker, LOL! I have nothing but love for you all and I totally wish the best for all of you because the passion I see in your writing, styling, and camaraderie makes me proud to be a fashion blogger. So of course I'm sure you all know what this little 2 minute speech is leading up to.........GIVEAWAY!!!! 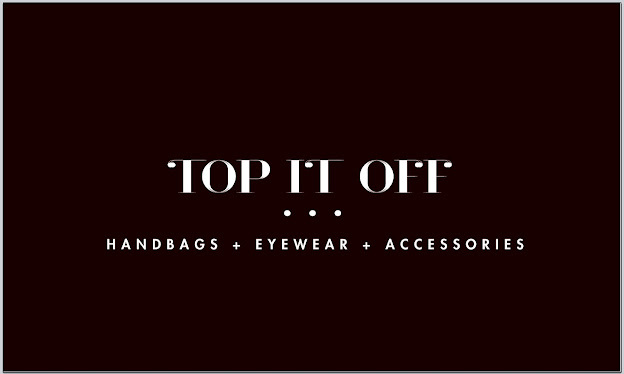 As of this moment, I have no idea what I'm going to do so check back in a couple days (Friday to be exact ;-) and the task and object of desire will be revealed ;-) I will also tweet about it so make sure you are following me here. Well guys....I did it again. 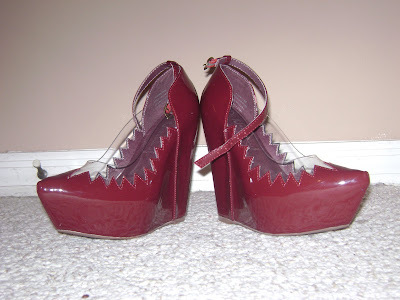 I bought ANOTHER monster wedge heel. I promise this is the last purchase. I mean, it's getting absolutely ridiculous, lol. But I just seriously love the extreme designs, extreme heel, and extreme fashion forward look they convey. 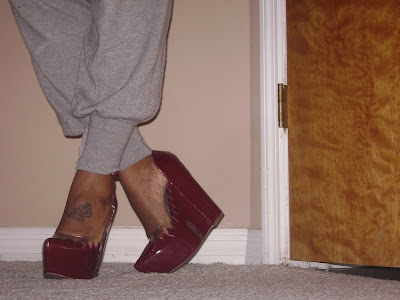 This time around, I fell for the Jeffrey Campbell Audrey Platform Wedge heels below. 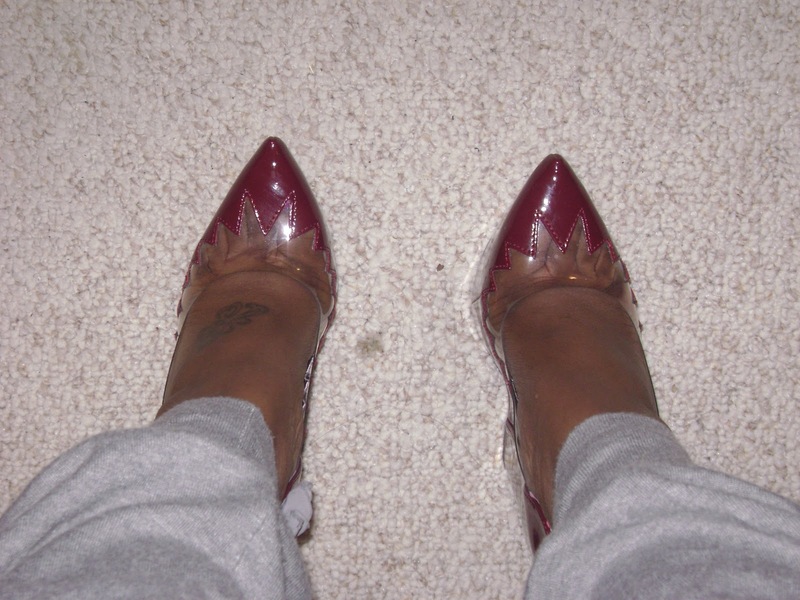 Fun fact, out of my extensive shoe collection, this is actually my very first pair of JCs. How weird is that? 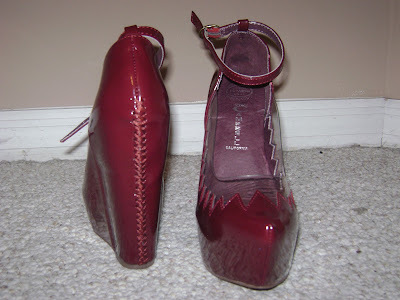 I love the stitch detailing on the back of the heel and gorgeous wine color. I also adore the clear, zigzag panel. So cute! These bad boys stand about 9 inches high!!! The actual heel is about 6 inches. I was like whoa! LOL! Hmmm.....where to rock these babies at???? And when? Oh yeah, got an event to go to with the bff and a comedy show to attend next week. Whew hoo! Congrats on your 200th mama and those shoes are HOT! The shoes are TDF!!! Hotness! Congrats on your 200th follower! And you know I am loving those shoes right?!?!? Aww *wipes tear* Thanks for the love! 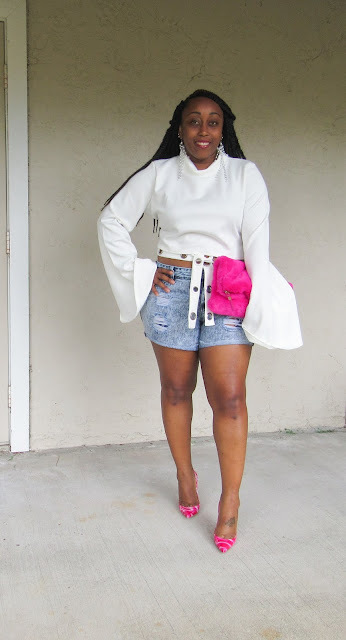 You fashion bloggers give me life seeing that I chase after children all day! I need inspiration where I can find it. Girl, those shoes are fierce.You did an injustice by not showing us the pants though. They look super fly!! Those shoes are just GORGE!!!!!! Those shoes are HOT FIRE! I love everything about them, but I was mostly drawn in by the color. Super cute! OMG, those shoes are gorgeous. And I am already tall. So when I wear them, I feel like a GIANT sometimes. Cannot w8 to see what you wear with these. It's official! I am getting these shoes! I have been stalking them since they came out! I love JC! Congrats on 200! I am a new follower so your over 200! Congrats on 200 followers! I only own a couple prs of wedges. A travesty I plan to immediately rectify! Congrats on your 200!! And I love those shoes! At first I was like, ehh maybe not. But when I kept on scrolling they began to call out to me lol! Lovely! And I agree, the clear zigzag panel is haute! Congrats on your 200! and those shoes are fierce! At first I was like ehh no but as I kept scrolling they started calling my name lol. And the zigzag panel adds a sweet touch! OMGEEEEE, they are just fab and congratulations. So glad I am one of them! A nice pair of shoes makes a girl happy ;-) Love it! Those shoes are hot! But the heel it too high for me. I'm already 5'10 so I guess I wont be getting those. Congratulations on 200 followers! Those are gorgeous, I love the color and detail as well! & Congrats on 200 followers! Congrats on reaching your 200th follower! By the way, those wedges are KILLER! Love it! Great giveaway!! Following you on twitter! Those are great shoes!! I love Jeffrey Campbell!